Choosing a fence is a vital aspect of designing your home, and ensuring you select a look that will increase its curb-appeal and subsequent value. The most important part of this decision is ensuring that you end up with a fence that will provide you with stylistic continuity – from the front fence and gate to the interior of your home. Our eyes are naturally drawn to symmetry and balance, while jarring elements can be off-putting. If you have a heritage or traditionally-styled home, such as a cottage or provincial home, you need to choose a fencing style that will suit this and create that all-important symmetry and your best option is to go with a heritage or traditional fencing style. So, to help make your decision easier, here’s the ultimate guide to all the styles you can choose from. What is a Heritage or Traditional Fence? A heritage or traditional fence is a fence that incorporates materials and stylistic elements from previous periods. The terms often refer to styles of fencing that are ‘timeless,’ which means they will never go out of fashion because they have been in the design vernacular for years. They are different to ‘modern’ styles of fencing because modern styles of fencing are all about current fashion. These types of fencing suit modern homes because they include the striking, bold colour and design choices that aren’t suited to the more reserved stylings of a traditional house. What Stylistic Elements Can I Expect from Heritage or Traditional Fences? The stylistic elements of heritage and traditional fencing are varied, but they are all tied together by a sense of ‘restrained elegance.’ This is typified through primary colours and shades, such as blues, greys, blacks and whites and even pastels. Materials typically consist of steel and wood, and sometimes brick. Shapes are usually quite stylised, and typically feature artistic flourishes such as spear or star heads, pickets and even carvings. Wooden picket: This is a classic style and a very popular option for those seeking to fence a heritage styled-home. It consists of either steel or wooden pickets that are typically painted or coated to suit the palette of the house. Palisade: This style is typically associated with Victorian terrace houses, and it consists of spaced metal or wooden section, topped by decorative elements such as spears or stars. 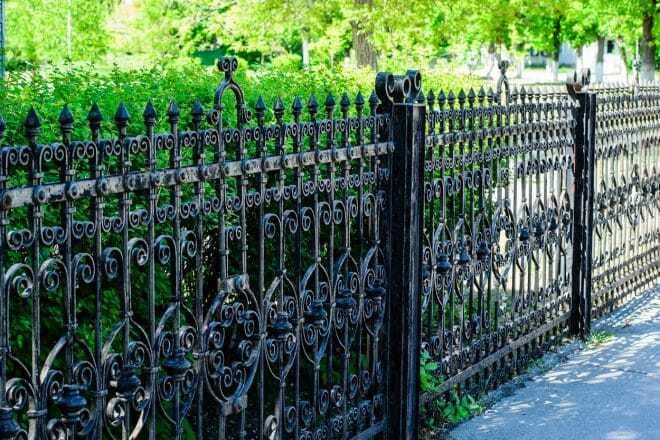 Wire fencing: Usually just a metal frame filled with sections of wire, these fences can be made to look beautiful and traditional, especially when powder-coated white or black. Post and rail: Perfect for properties on acreage, as they are a cost-effective yet stylish way to fence off large sections. Typically associated with Federation-era properties and a hark back to classic Australian homestead. A very simplistic design consisting of metal or wooden posts and rails. Freestanding or Retaining Wall: These styles are usually constructed out of brick or stone. They are a particularly elegant option and offer excellent security and privacy. Brick Infill: Brick infill fencing uses posts made of either brick or stone, which are then linked by sections of either wooden or steel paling or pickets. Perfect for homes that are a blend of traditional and contemporary, as they offer incredible stylistic flexibility. How Do I Know Which Style Will Suit My Home? If you have a traditionally-styled or heritage home, chances are most of these styles will work. However, you need to be careful when it comes to choosing your materials and colour, or you can make some serious errors. For example, a brick infill fence with steel sections will look out of place out the front of a Victoria-era weatherboard cottage. If you don’t have a background in home design or construction, it can be difficult to know what works, so it’s best to consult with an expert. Most quality fencing companies will be happy to provide you with a free no-obligation quote, which will include suggestions on what will work with your property. A fence can be a significant investment, so it’s always best to take the time to get it right the first time. You may think you can get away with just copying a look out a magazine or something you like in the neighbourhood but without an expert opinion, you may end up with an eyesore that is expensive to take down and replace.